While the Thunder's Russell Westbrook roars after his game-winning three, fans in Denver are struck with disbelief behind him. Russell Westbrook has been on a tear all season long, doing anything and everything to lead his Thunder to victory. With his amazing athleticism, skill, and hustle comes amazing stats. Stats that have inked his 2016-2017 season in the history books. Westbrook broke Oscar Robertson’s single season triple-double record Sunday night against the Denver Nuggets. He recorded 50 points, 16 rebounds, 10 assists, and hit the game-winning shot. The Oklahoma City Thunder traveled to Denver to face the Nuggets last night. The Nuggets needed a win to keep themselves in playoff contention. While Denver was playing for a spot in the postseason, Oklahoma City was playing to get Westbrook in the history books. Westbrook needed a triple-double to surpass the 55-year-old record of 41 triple-doubles in one season. With an assist early in the fourth quarter, his tally for the game jumped to 10 and Westbrook made history. It was triple-double number 42 for him. 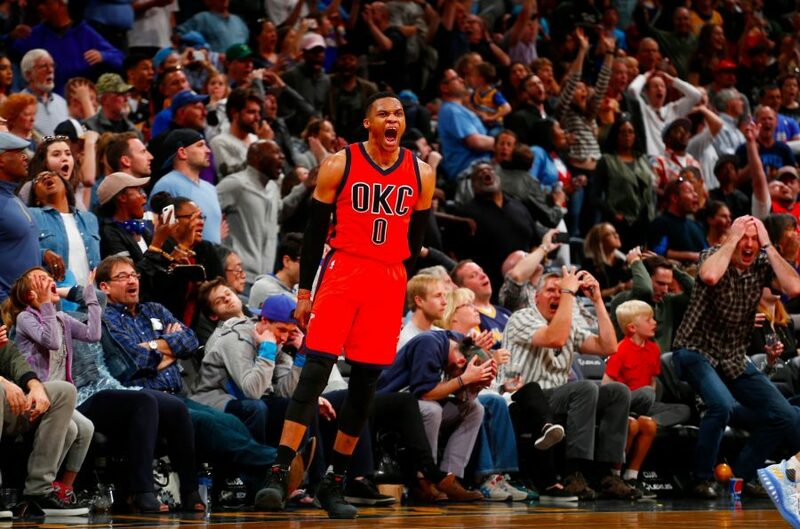 While he and his teammates did celebrate a little during the next timeout, Westbrook knew there was unfinished business. With under 10 seconds left in the game, the Thunder found themselves with the ball down two. Everybody in the arena and everybody watching on their televisions, phones, and tablets knew who was going to take the last shot. A scramble for the ball broke out and inevitably ended up in Westbrook’s hands. Westbrook skied for a deep three just a few feet ahead of the half court line. He nailed it just as the final buzzer went off, giving his team the 106-105 victory. Not only did Westbrook make history with his amazing 50/16/10 game, he also wiped out the Nuggets’ playoff hopes with a final second dagger. Westbrook’s 50 points, 16 rebounds, and 10 assists was just one of the many incredible stat lines he has put up this season. This game, with the game-winning shot and all, may have earned him his first Most Valuable Player award. No matter what happens in the Thunder’s final two games, Westbrook will have averaged a triple-double for a full season. A feat no one thought they’d see ever again. Westbrook just stuck to his “why not?” attitude and may have turned in the best single season a player has ever had.